Safer, reversible and less invasive vasectomy! A vasectomy is a surgical procedure that is taken in order to inhibit the reproductive process. 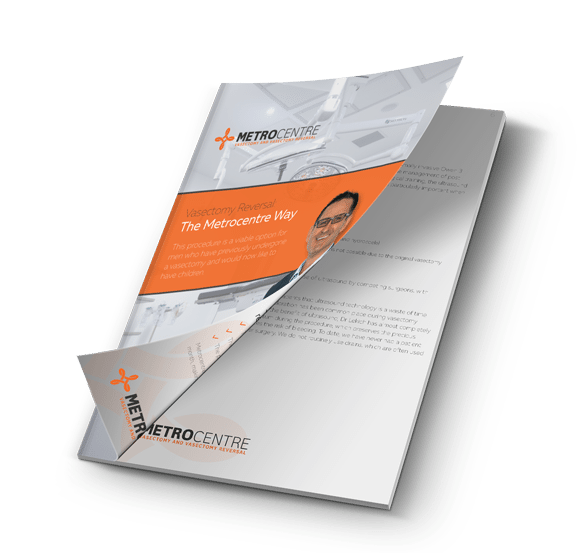 29,000 Australian men undertake a vasectomy procedure every year, and Metrocentre is dedicated to providing these men with the most advanced and precise vasectomy surgery available with little to no post vasectomy pain. At Metrocentre, we only perform the open-ended vasectomy as it reduces post vasectomy pain (related to congestion) syndrome and maximises the potential of a successful future reversal. The most common queries - answered! Metrocentre is dedicated to men who would like to explore their options in regards to contraception and demand to be treated with the most advanced and precise surgical techniques available. Metrocentre offers same day consultation and procedure, additional anesthesia for nervous and anxious patients, a high resolution ultrasound scan to prepare a tailored surgical approach, operating microscope and a specialised theatre.